Anousheh Ansari is a serial entrepreneur and cofounder and chairman of Prodea Systems, a company that will unleash the power of the Internet to all consumers and dramatically alter and simplify consumers’ digital living experience. Prior to founding Prodea Systems, Anousheh served as cofounder, CEO, and chairman of Telecom Technologies, Inc. On September 18, 2006, Anousheh became the first female private space explorer, the fourth private explorer to visit space, and the first astronaut of Iranian descent. She is a member of the X Prize Foundation’s Vision Circle as well as its Board of Trustees. She is a life member in the Association of Space Explorers and on the advisory board of the Teachers in Space project. I immigrated to the United States from Iran, a teenager who didn’t speak a word of English. Growing up in Iran, my head was always in the clouds. At night I would spend hours watching the stars, wanting nothing more than to become an astronaut, to fly to space and touch them. My mind was filled with a future where starships would fly to every corner of the universe. I would be the science officer aboard the Starship Enterprise, traveling through wormholes and exploring strange new worlds and new civilizations—to boldly go where no one has gone before. I dreamed of a future with time machines, parallel universes, teleportation and a United Federation of Planets. I was fascinated by all these possibilities because when you’re a child, everything is possible—there are no boundaries, and everything is a puzzle to be solved, every dark corner an opportunity for discovery. When I arrived in the United States, the realities of life put me on a completely different path. I went to school and studied electrical engineering while working full-time. My family moved to the United States with nothing but hopes for a new life and a better future, so finding a job to support myself and my family was important. I found a job at a major telecommunications company, MCI, and started my career as an engineer. Working at MCI was a great experience—I learned the ins and outs of the corporate world while learning a lot about the telecom industry. President Roosevelt once said: “Far better it is to dare mighty things, to win glorious triumphs, even though checkered by failure, than to rank with those timid spirits who neither enjoy nor suffer much, because they live in the gray twilight that knows neither victory nor defeat.” I like to believe that’s how I live my life, and so, a few years later, after meeting my husband at MCI, we both left the company and started on our road to entrepreneurship. Building a company from scratch and growing it is exciting, but also a big challenge. It is very much like raising a child: while it’s very rewarding, it also has its share of ups and downs. As a female CEO of a tech company, I learned that even though I lived in one of the most advanced western societies, certain prejudices against women in leadership positions, especially in high tech, still persevered. However, my philosophy has always been to do my best in everything I set my mind to and let my work speak for itself. This has proven to be a most successful strategy and has turned many skeptics into believers and friends. Although I became a very successful entrepreneur, I still felt that something was missing in my life, and that was my passion for the stars. While I kept my dream alive in my heart and continued to study and learn about space, I wanted to do more. I didn’t want to become one of those people who would just complain about what’s wrong in this world—I wanted to do something about it and to change it. Sometimes it is easier to take risk when you have very little to lose, but as a successful entrepreneur, taking risk and daring to do big things takes on a whole new meaning. I think most people in my shoes would have given up on their so-called crazy dream and stayed in their comfort zone instead of stepping out and facing uncertainty and potential failure. But for me, it wasn’t just a dream. It was a burning passion that gave me a sense of purpose and direction in life. I’ve always believed that if you want something bad enough in your heart, the universe conspires to help you achieve it. I consider myself a very lucky person, as one of the few who is living out a childhood dream, but as Louis Pasteur said: “Chance favors a prepared mind.” For me, a series of fortunate events led me to Star City, Moscow, and ultimately, to the stars. It all started with meeting Peter Diamandis, the founder of X Prize Foundation. He is, like me, crazy about outer space, and wanted to do something about opening up access to space. Peter had launched a $10 million competition for anyone not affiliated with a government agency to build a spaceship that could go to space twice within two weeks. It sounded crazy, but to me it was the first opportunity to be part of changing the future for millions of people who shared my dream of space travel. Peter came to visit us and tell us about his prize, and without hesitation, we saw the value in what he was doing and partnered up with him. The prize was launched as the Ansari X Prize and had twenty-six teams competing from seven countries, each with their own unique and innovative approach on how they would reach one hundred kilometers into space. Ultimately, in a great historic moment, the team from Mojave Aerospace won the prize in October of 2004. After their success, no one would ever again question the power of a small group of focused innovators to achieve seemingly impossible tasks. On that same day, Virgin Galactic was born, and we knew that our goal of launching a new industry was achieved. Many changes have occurred as a result of the prize, as well as all of the regulatory reform that came from our efforts with the X Prize. NASA started warming up to partnership with small private companies as well as using incentive prizes to bring a wide range of innovative approaches to solve many technical challenges. On the first anniversary of the Ansari X Prize, I got an invitation to go learn about the Russian space program and train as a backup. I couldn’t have been happier. Even though it was one of the coldest winters in Moscow, I didn’t care. This was my chance to be part of the space program and get one step closer to my dream. Many people told me I was crazy—that I’d freeze in the Moscow winter, that training on a Russian military base alone was not safe. They even questioned my sanity, but I didn’t care. I was like a kid in a candy store: I couldn’t wait to get on the plane and meet all of the astronauts and cosmonauts in person, to walk in the hallways where Yuri Gagarin walked, to visit where Tereshkova—the first woman in space—prepared for her historic mission. To me, this was the opportunity of a lifetime, and I would not miss it. So I went and trained as hard as I could. I was faced with some resistance when I first arrived in Star City, but after a couple of months of hard work, when they realized how serious I was about my training and how passionate I was, all of the instructors became my best friends and advocates. I worked tirelessly and trained for nine months as a backup for a Russian Soyuz mission to the International Space Station—and just three weeks before the flight, I was told that a primary crew member failed one of his medical exams and that I could take his seat. I spent eleven glorious days in space. I saw Earth as a beautiful blue ball in the vast velvety darkness of space and felt its warmth and energy. I saw a sunset and a sunrise every ninety minutes, and billions of shining stars surrounded us. There is nothing else like it out there. When you look at Earth from above, you have a new perspective. You can see how insignificant we are compared to the universe that surrounds us, and even more, how insignificant the things we fight over are. Floating in space, from my safe haven among the stars, I saw a world without division—just one Earth—in a vast universe. From my vantage point, the boundary lines separating countries and people had become blurred and then invisible. I knew that back on Earth these imaginary lines were very much present and causing all sorts of problems—but up there, the lines did not matter, did not exist. Back on Earth, I am focused on my new company, Prodea Systems, which was launched on the same day I launched into space. At Prodea, we are trying to change how people use technology and make it easy and seamless so everyone, from any place, using any device, can enjoy and benefit from the use of technology. As I work to bring this to people all over the world, I am constantly reminded of that beautiful image of our planet and how we are all the same, with similar wants and needs. In parallel, through my work with the X Prize Foundation and other organizations, I continue to make space more accessible to everyone so that anyone who wants to can have the opportunity to experience what I experienced. I want to make access to space safe and inexpensive so that we can fully benefit from the resources in space to better our lives here on Earth. We have also expanded the use of incentive prizes to solve the biggest challenges humanity faces. Whether at the bottom of the ocean or out in space, in the smallest building block of our bodies or the depth of the sun, we’re turning every challenge into an opportunity to advance human life and make our planet a better place for all of us to live together. We live in a unique time, one that may become a pivotal point in the history of mankind. As humans, never before have we had so much potential to build or to destroy, to grow and seed the universe with our species or to annihilate, to give life or propagate death. Over centuries we have mastered skills and technologies that have given us enormous individual power and shrunk time and space between us, but with great power comes great responsibility, and we must use our imaginations to take risks, break all the boundaries, and challenge the status quo. We cannot be afraid because fear is death—a life in fear is a life not lived. Take it from someone who has been all the way down in the gutter and all the way up to the stars, someone who has gone from one high to a new low and then back up again. The journey is life, and how we live it is our choice. Let’s make the journey worthwhile. 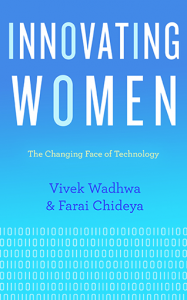 Excerpted from Innovating Women: The Changing Face of Technology by Vivek Wadhwa and Farai Chideya. Copyright 2014 by Vivek Wadhwa and Farai Chideya. Excerpted by permission of Diversion Books. All rights reserved. No part of this excerpt may be reproduced or reprinted without permission in writing from the publisher. This entry was posted in Advocacy, Member Input, News and Views, Points of Interest by admin. Bookmark the permalink. Disclaimer: This comment is based on my personal opinion and is not a commentary from the Computer Science Teachers Association. I had the pleasure of hearing a brief speech from Vivek about the many women he has encountered who still struggle to find gender equality in the CS/IT work place. It is a sad tale and continues to be a topic that many don’t believe is based in fact. For those of us who have experienced it, we know that it is a reality. Vivek and his wife have even experienced threats and a lot of backlash based on their attempts to shed more light on the problem. For those men who have supported and continue to support women in Computing, I applaud and thank you! We do appreciate you and your support. As CS Ed Week approaches, I hope we have a lots of women and girls participate in whatever activities our wonderful CSTA members have planned.